SEJONG – Just after he was elected in May 2017, President Moon Jae-in showcased an electronic dashboard to the media, which was set up in the presidential office for the purpose of monitoring the number of jobs created. A large portion of citizens including young people were pinning big hopes on the new administration. But they have not seen him pose beside the dashboard at any time in the 20 months since then. And 2018 was one of the few periods in which young Koreans had greater difficulty than before in getting jobs and more small-business owners went out of business because of worsening economic factors. 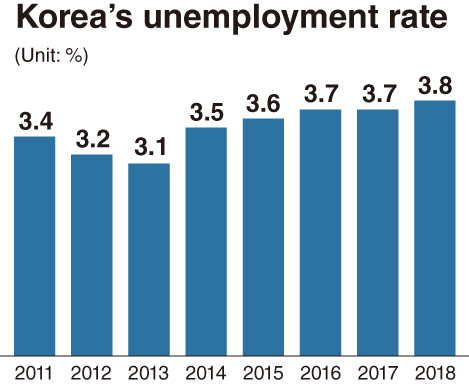 Amid the gloomy situation over the employment market, a global organization predicted that the 2019 unemployment in South Korea could fall into the worst level in 18 years or more. 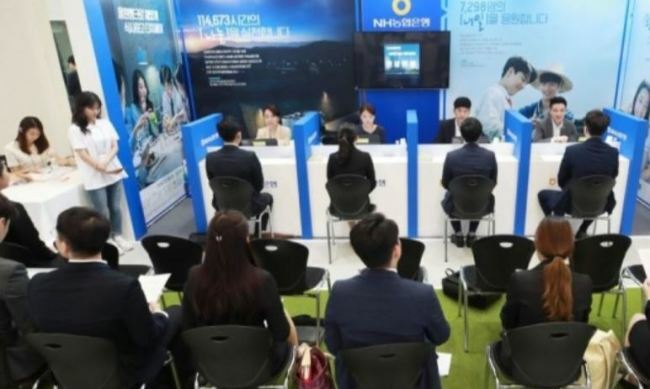 The Organization for Economic Cooperation and Development, in its recent economic outlook on some member countries, forecasted a 4 percent jobless rate for Korea this year. This means that the unemployment rate may touch the 4 percent mark for the first time since it posted 4.0 percent in 2001. The OECD cited the drastic hike in the statutory minimum wage, manpower restructuring among manufacturers and the drop in the number of the people for production activities, aged between 15 and 64, for major factors for the current sluggish employment. It pointed out that the sharp hike in minimum wage could burden employment and the growth of gross domestic product. The jobless rate, which stood at 3.1 percent in 2013, rose to 3.8 percent in 2018, according to Statistics Korea. The number of jobless people increased to 1.073 million, up about 50,000 from the previous year. Youth unemployment is more critical, with the monthly figure hovering between 8 percent and 11 percent. Although the government highlighted that the number of employed in their 20s increased by 61,000 to about 3.73 million in October 2018, some experts remain skeptical about the quality of the jobs created. Furthermore, the “extended unemployment rate” that includes job seekers, those who have given up on looking for a job and workers looking for night jobs as a sideline reached 22.5 percent. Macro-economy experts have raised the possibility that Korea may surpass the US in terms of its unemployment rate in the coming months. As of the third quarter of 2018, Korea saw its jobless rate reach 3.8 percent, close to the 3.9 percent recorded in the US. For the first eight months of this year, Korea saw its number of unemployed people come to 1.129 million per month on average, up 45,000 from the same period in 2017. The 2018 figure is the highest since the nation began to record related data in 1999. In addition, Korea’s jobless rates among people aged between 15 and 24 years old and seniors between 55 and 64 years old have already surpassed those of the US.